Marcos de Niza boys volleyball snapped a three-game losing streak with a win Tuesday against South Mountain. The Padres (2-4, 0-0) beat the Jaguars 3-1 to earn their second home win of the season. Coach Steve Hammond credited the win to the Padres learning from teams with more defensive playing. The Padres won the first set after capitalizing on a number of early errors by the Jaguars (2-7, 0-0). Gameplay was back and forth while the teams reached a 15-15 tie. Marcos de Niza then created a comfortable 20-16 lead after a string of pass errors changed the tempo of the set. Despite a service error late in the set, Marcos de Niza pulled out a win, 25-21. The Jaguars took the second set, utilizing Damarion Pouncil’s four blocks to earn a 25-17 win. South Mountain coach Falonia Edenburgs said that a positive attitude helped the team make some key plays. The third set quickly went in favor of Marcos de Niza. Senior Alex Wong started the match serving and helped the Padres take an early 5-0 lead. The Padres kept the momentum going, and an ace from Wong later in the set energized the team further. Two errors by the Jaguars closed out the set, with the Padres winning 25-13. Coming off a loss in the second set, Wong said that staying focused helped his serving momentum early in the third. The fourth set saw the heaviest offense of the match. The Padres and the Jaguars went point-for-point from the start, with most of South Mountain’s points resulting from Marcos de Niza’s pass errors. Marcos de Niza called a timeout with the set tied at 21-21. Hammond said he used the time to encourage the team to defend the point. “We just needed to make little adjustments, since they were doing an excellent job of tipping over us,” he said. South Mountain’s Dametrius Hardeman kept the Jaguars competitive, putting up a kill and a hit for a 23-21 lead. 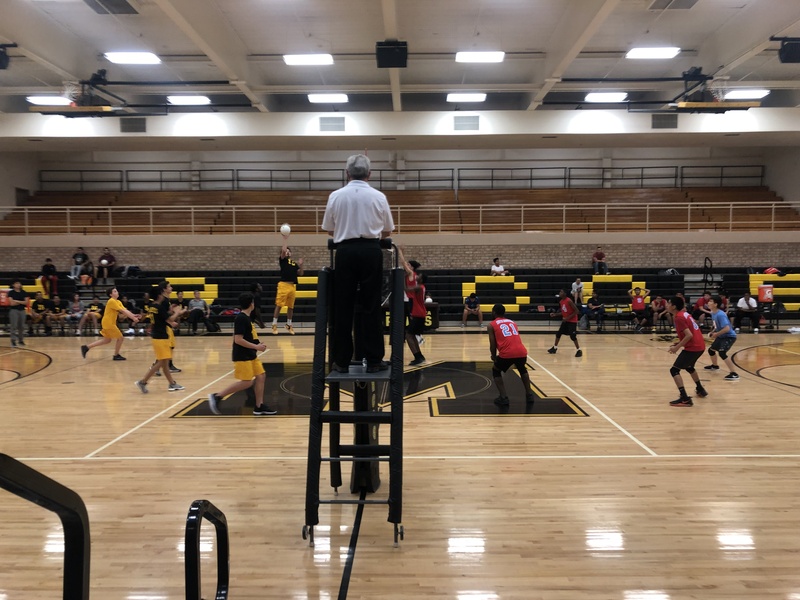 Three consecutive errors by the Jaguars put the Padres poised to win, and Wong served the game-winning point to end the contentious set, 25-23. Wong said the last set was “crazy,” and since he knew that it would be a close call, he was pleased the hard work was paying off. Hammond said the young team worked on developing more fundamental skills this match, and he is looking forward to improving the team’s comfort with the sport. The Padres next match will be Thursday night at Betty H. Fairfax.